Americans are often criticized for using their mobile devices too much and for exercising too little. But what if cell phone use and exercise were combined? Luckily for us, “there’s an app for that,” in fact, there are several apps for that. From paying users to go to the gym to tracking their caloric in-take, there are apps designed for nearly every area of health and wellness. Below, Urban Agenda NYC outlines some of the best apps to download in order to stay active and motivated. If an app that gives users money to make their fitness goals sounds too good to be true, consider the fact that Pact also takes users’ money when fitness goals are not met. The Pact app (formerly known as Gym Pact) allows members to make a “pact” to exercise, log meals, or eat vegetables daily for a user-specified period of time. When people sign-up, they can have $5 to $10 deducted from their credit card or PayPal account for every day they miss. On the flip side, if users stay committed to their pact, they get paid 3¢ to $5 per week until they reach $10. Their payout comes from users who didn’t make their pact. How does the app know they’ve been committed? Users are expected to check into one of the 400,000 gyms in the Pact database and stay in its location for a minimum of 30 minutes. To prove they’ve followed their meal goals, users must take a picture of their food using their mobile phone. Other users are encouraged to vote down photos that shouldn’t count to prevent cheaters from cashing in. Deemed by Headspace as “the gym membership for the mind,” this mobile health platform helps train your mind to meditate for at least ten minutes each day. 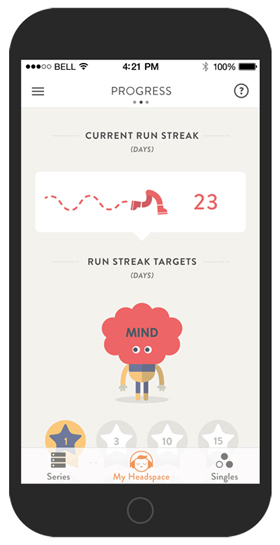 With well over one million users, Headspace is revolutionizing the way people cope with their daily stresses. Users can try a 10-day free trial where co-creator and former Buddhist monk Andy Puddicombe guides them in 10-minute meditation sessions. After the free subscription is over, users have the option of a monthly or annual subscription. A full member has access to 350 hours worth of guided meditation lessons. Once the foundation stage of mediation is complete, Headspace users can move on to meditation in the form of health, performance, relationships, or Headspace Pro where they are able to guide their own sessions. Fooducate is like a personal dietitian in app form. It has a database with over 250,000 food products that are graded from A to D based on their nutrition facts panel and ingredient list. Users can even scan a product’s barcode to see its personalized nutrition grade. The less processed the food, the higher the rating. The Fooducate app can track the quantity and quality of calories consumed by a user as well as their daily water consumption and exercise. Other features include healthy recipes, daily tips, and forums where users can address questions to the Fooducate community. Winning first prize in the U.S. Surgeon General Healthy App Challenge for best nutrition app is clear evidence that Fooducate helps improve its users health through better food decisions. Believe it or not, people can monitor their heart rate with their smartphone and the Instant Heart Rate Monitor app from Azumio. Each time the heart pumps, it sends a pulse throughout the body that causes the skin’s capillary vessels to expand. When this occurs, the color of the skin slightly changes. To have their heart rate measured, users must place their finger over their cellphone camera’s light so it can record the color changes in their fingertip with each heartbeat. By doing so, it measures the user’s beats per minute (bpm). Instant Heart Rate Monitor provides users with their results using a simple graphical interface and updates them on their progress. The average heart rate range is between 60 and 100 bpm, and variations in those numbers can tell someone a lot about their general health. The Instant Heart Rate Monitor also features in-app purchases like the Standup Test™ that provides users a detailed analysis of their heart’s strength based on how hard it needs to work when the individual stands. 45 million runners currently use this fitness-tracking app. Although it’s called RunKeeper, it can monitor many activities like walking and cycling using a smartphone’s GPS. The app provides detailed stats on pace, distance, and time and even gives coaching audio cues at designated workout intervals to motivate users during their exercise. Other features include music that matches the tempo of the workout, the ability to share pictures while taking part in the activity, and in-app training plans. RunKeeper logs the history of the user’s activity, so they can track personal bests or milestones against their goals. The app also connects to several social media platforms so that users can post updates on their exercise progress.